bmyoungs wrote: Source of the post It'll be a bit before I have a chance to finish the floating shelf. I thought Father in Law was building? Get your story straight. I think he is, they leave for Alaska in a few days so I might just get the wood cut at home Depot and do it. Half way done. Had to get two mounts since the first one didn't fit my TV. Just the entertainment shelf and cable management. Shelf is next. I was planning on the sound bar going in the floating shelf but I changed my mind. So now redesigning what I want below sound bar. Now you don't even need a shelf. Just hide the cables, ditch the stand, you're done. Tyler wrote: Now you don't even need a shelf. Just hide the cables, ditch the stand, you're done. Okay need some opinions. Planning to move my 55" TV to above my fireplace. It will fit if I can prop the stand piece up another 2", or I could mount it. Mounting seems like the way to go, right? ejhartman91 wrote: Okay need some opinions. 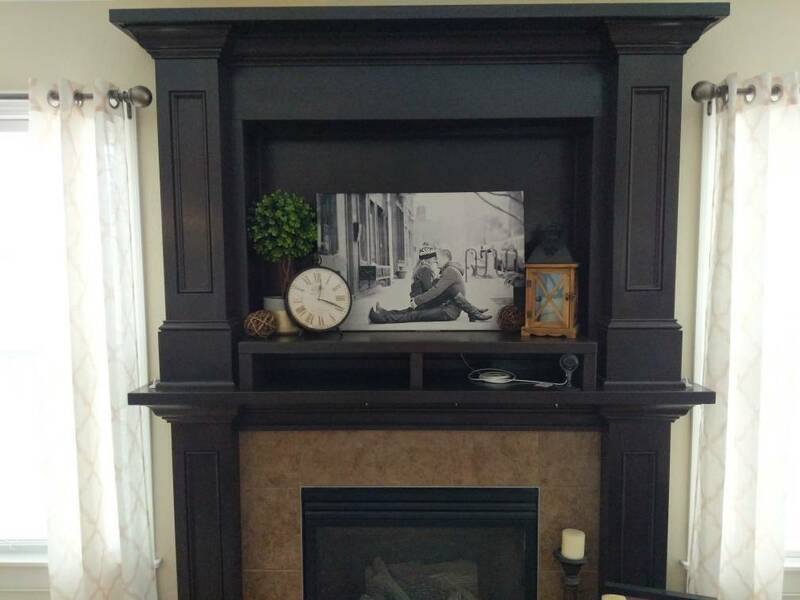 Planning to move my 55" TV to above my fireplace. It will fit if I can prop the stand piece up another 2", or I could mount it. Mounting seems like the way to go, right? I can't imagine it will fit inside of the the recessed part though? You would need to build the wall mount stand out, but that wouldnt look good. I need some measurements. Tyler wrote: I can't imagine it will fit inside of the the recessed part though? 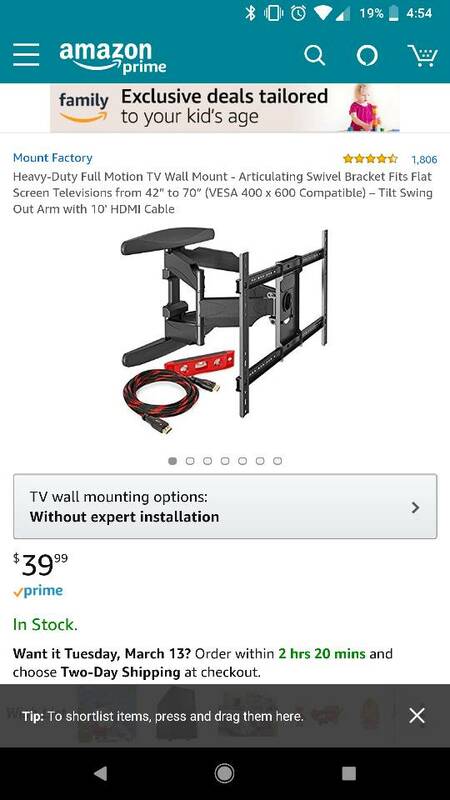 You would need to build the wall mount stand out, but that wouldnt look good. I need some measurements. It won't fit in the recessed part, no. However, the surface it would sit on is actually about 6" deeper than that recessed area. We either need a taller shelf for that area or something to raise the shelf that's in there currently. 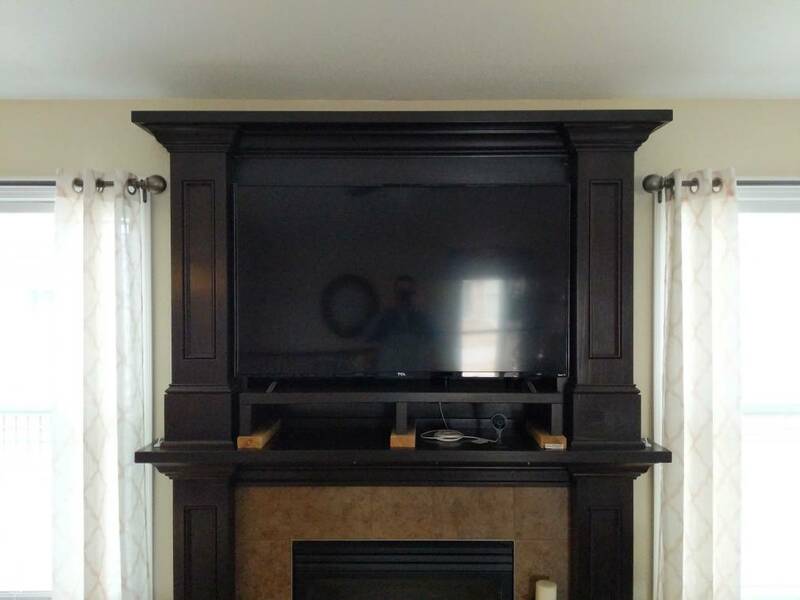 This is because the base of those molding "pillars" makes the opening just small enough to prevent the TV from fitting. Is the shelf secured so you can't take it out? So it wouldn't fit into the deep part, but it would fit between the 2 pillars without going on front of them or would it need to go in front? If it fits inside of the 2 pillars I think it would look cool to wall mount it by building out the mount far enough so it fits perfectly within the side pillars. If it has to be in front of the pillars maybe it's too big and get a smaller TV? Tyler wrote: Is the shelf secured so you can't take it out? Thanks! That answers all my questions. That is such a perfect fit!! My vote is to ditch the shelf entirely and modify a wall mount to work. That will be the cleanest. Maybe even find a way to mount the nest cam under the TV? Will I have to modify this mount? If so, in what way? ejhartman91 wrote: Will I have to modify this mount? If so, in what way? If you got a telescoping one you wouldn't need to modify it (build it out with wood away from the wall), as long as the longest telescoping position is longer than the area is deep, which I think this would be. For now, we are going to use the shelf, but I plan to mount it at some point. I will need to take some measurements to see how far the mount needs to come out from the wall. The biggest issues with the shelf are the 2x4's look out of place and the soundbar covers part of the bottom of the screen when you are sitting down (for example, the ESPN "bottom line" would be covered).